A report by MoffettNathanson found that the pay cable industry lost 762,000 subscribers in Q1 2017, the worst drop ever. To compare last year’s Q1 saw a mere 141,000 subscribers lost. 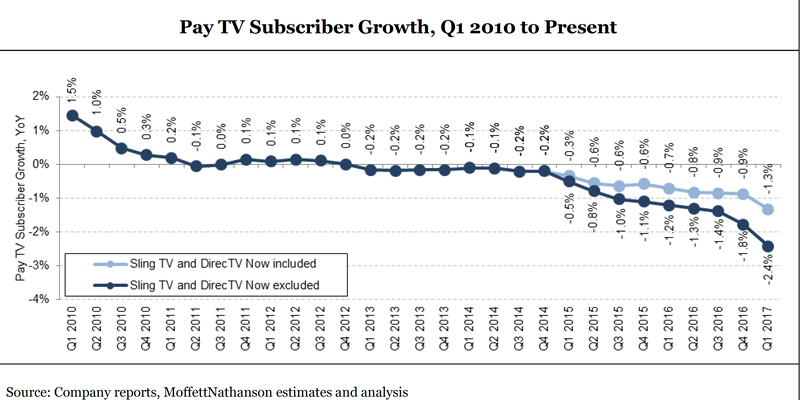 Analyst Craig Moffett said that the “Pay TV subscriber universe [shrank] at its worst ever annual rate of decline (-2.4%)” and there have been 6.5 million cord-cutter (and the new “cord-never” user who doesn’t install a Pay TV source at all) watchers since 2013. What does this mean? First it’s clear that cord cutting his here to stay. Now that nearly every must-watch program is available via streaming and, in many cases, all at once via Netflix and other services there is even less impetus to channel surf, once the primary mode of TV discovery. This means networks have to work harder to get their content in front of receptive audiences and it also means that services like Netflix and Hulu are truly taking a huge chunk of the TV entertainment market. Now that sports and international programming is headed to streaming we can only expect this trend to accelerate. All of this churn is making the cable carriers restless. They are currently blaming retention offers for their inability to keep customers. Moffett, however, isn’t fooled. “Whatever the cause, it seems naïve to suggest that we have seen the worst of the trend. Instead, this is almost certainly just the beginning,” Moffett told Multichannel, a news outlet covering TV and cable.